arothafel wrote: I dunno... it could be the camera angle. I see CB in every turn. Even in your screen capture, he's not exactly straight up. Perhaps if we were to see this from a front side POV we'd see some CB. haha, yes, you are right. It's because of the camera angle. But overall, is his CB enough in this video? I have these questions is because I see some similarities in his skiing and mine. And my friends remind me many times that my CB is not enough. Bingster, the Essentials sample turn is the right place to look for how much is enough. In general HA needs more CA and CB and that is something we worked on throughout the day. Especially more CB when the left foot is the stance foot. I do not yet "own" all of the essentials in sufficient amounts. That is my goal (and I know it's many of yours too). Coming into this program I have to say that I underestimated how much work it was going to take to replace my old movement patterns with the PMTS essentials. There is no doubt that PMTS can provide some really quick gains (the phantom move for instance), but truly owning the movements can take a lot of work. 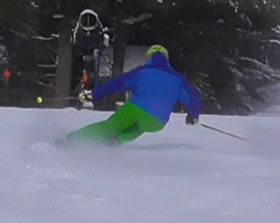 For those of us that have years and years of old habits ingrained in our skiing it is a challenge to make PMTS the "default" movements; the ones that you need to consistently come out when the going gets tough. That's probably the most inspiring thing I've seen in accomplished PMTS skiers (especially Max_501; PMTS movements are "his" movements, they're not something that's been layered onto his skiing). Max_501 got there through dedication to the instruction and practicing the drills, but as HH says in his latest DVD, drills have their purpose, but it's what you do in your free skiing that ingrains the movements. Max_501 pointed out many times that he wastes no part of the mountain when he's out skiing. He uses all of it to continually practice the "good" movements. So now when I'm out skiing with friends I'm using the cat tracks to do O-frames and I'll start out each run with some javelin turns. I spent yesterday using the outside pole drag to get my CB in a better place (and it was a powder day!). As they say, perfect practice makes perfect. If you're doing the PMTS drills then get some video and verify that you're doing them correctly. This forum is a powerful tool to achieving your goals in PMTS. We should all be using it more (and by that I mean posting video). Put your skiing "out there", be humble, and be prepared to improve because this place is a valuable resource for all of us. This was my first attempt at the Power Release drill with Max_501 taking video. Max_501 sent me an image capture that looked like this and said that it was too bad that I wasn't able to stand up after this position. Should have just made that your avatar and not told anyone. Haha. This is awesome skiing. 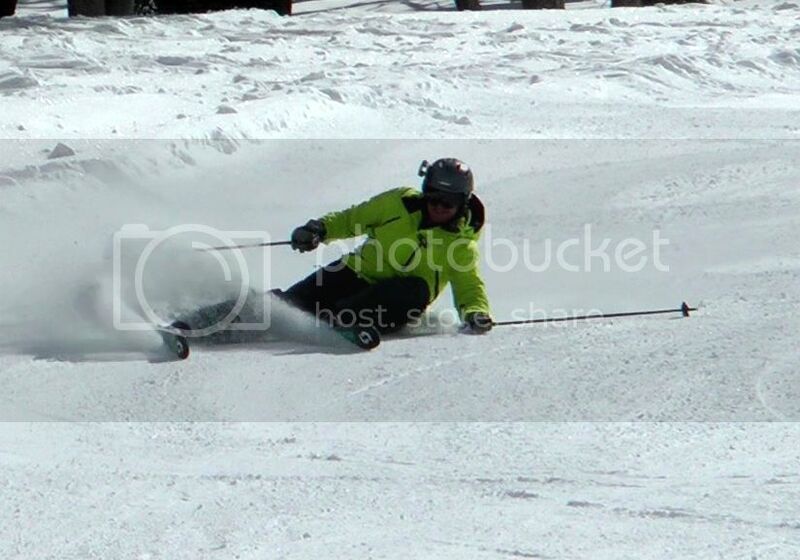 What a huge difference since I skied with you a couple of years ago. You should be proud. HighAngles wrote: I do not yet "own" all of the essentials in sufficient amounts. That is my goal (and I know it's many of yours too). Coming into this program I have to say that I underestimated how much work it was going to take to replace my old movement patterns with the PMTS essentials. There is no doubt that PMTS can provide some really quick gains (the phantom move for instance), but truly owning the movements can take a lot of work. 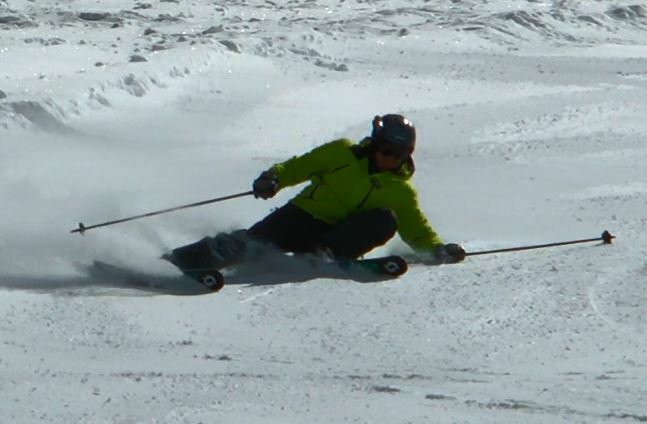 For those of us that have years and years of old habits ingrained in our skiing it is a challenge to make PMTS the "default" movements; the ones that you need to consistently come out when the going gets tough. This is so true. I didn't have a lot of formal instruction, and most of my race coaching consisted of "look ahead, roll your ankles, and go fast." I mainly learned by trying to emulate people who were faster than me. That resulted in huge push-off and hip dumping problems that took a while to get rid of. I've had to go completely back to the beginning, multiple times. [And I need to again after this year] The way I get a ski to carve now bears absolutely no resemblance to how I did it 5 years ago. It definitely is hard to make the movements the "default" when things get truly nasty. I thought I was getting stance ski balance in the high-C after skiing groomers with Heluva, but the Utah steeps quickly showed me I have a LOT to learn still. -Robert Frost, "The Road Not Taken"
HeluvaSkier wrote: Should have just made that your avatar and not told anyone. Haha. Good idea! This is serious vertical separation. The drills really do work. My goal is to have my avatar replaced with one that can approach the angles you're getting in yours, but have it be a "real" turn, not a sham that was the result of an egregious error in balance. HighAngles wrote: My goal is to have my avatar replaced with one that can approach the angles you're getting in yours, but have it be a "real" turn, not a sham that was the result of an egregious error in balance. BTW - green and black is "in". Is that what they call "body carving"? dbillo wrote: Is that what they call "body carving"? Too much CB and outside ski engagement for body carving. This ski season started out for me with a great deal of frustration. It would be great if we could always pick right back up where we left off from last season, but for most of us we know that's not usually the case. I realized that my skiing was in "conflict" with the mountain - I was fighting it every step of the way (err, turn down the slopes). HA, here's my own test for my counterbalance...In a turn I should be able to momentarily lift my free foot (inside foot) off the snow. Just an instantaneous tap, but if I can do that, I know that I'm getting things together. If I can tap the free foot off the snow in my drill, then I'm not stuck on it and can put as much or as little weight on it as I choose. If I can't tap that foot, then I know that I need to dial up my CA and CB. More counteracting enables more counterbalancing, as does a person's individual flexibility.